Interestingly they decided to place a radiator directly below the sink, an especially wasteful choice. The radiated heat would travel up into the porcelain, but as we know from studying electric power engineering, porcelain is an excellent insulator and would resist transferring the radiated heat. 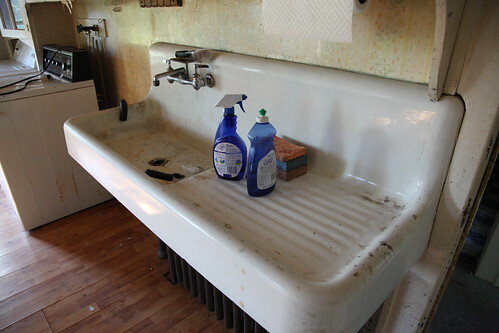 Anyway, it's also interesting to note the vintage washing machine, the drain port of which feeds into the sink's drain. Modern cleaning products sit on the "drying rack" area of the sink. Also note the cheap linoleum floor which looks nothing like the authentic hardwood floors upstairs.